Wake Forest is the 9th fastest growing among North Carolina's 552 municipalities. While we are rich in history and Southern charm, we are just as dynamic and forward thinking! As a result, commercial and residential growth continue to climb rapidly as businesses and people are drawn to our community. We pride ourselves on strategic, sustainable, planned growth. This is evidenced by our small area and corridor planning, transportation planning, historic preservation, public art vision, the Greenways and Open Space program, and Renaissance Plan for the Heart of Wake Forest. 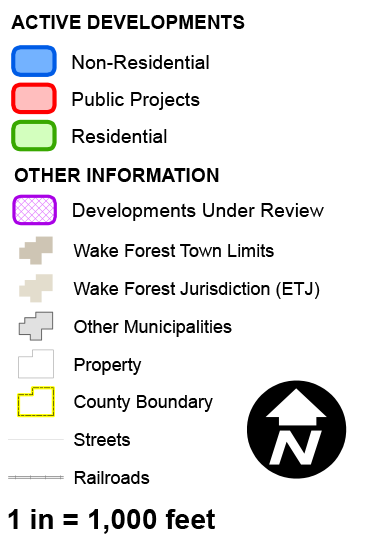 Zoom and pan to any area of Wake Forest on the map. Move the cursor over the development of interest, and click on the development. A PDF image of the approved plan will appear in a new window (large files will take a moment to display). Stockbury Manor and PowerHouse Row are currently under development in downtown Wake Forest. Both buildings represent innovative, multi-story, mixed-use buildings that will house over 80 apartments and several new retail stores. Read more about these developments. The Renaissance Plan, adopted in 2004, was updated in 2016 in order to maintain momentum, sharpen focus, and retain the vibrancy of our downtown. The updated plan has a focus on market readiness, housing infill, detailed streetscape plans, multi-modal strategies prioritizing bicyclist, pedestrian and transit usage, parking strategies, identification of private development/redevelopment opportunities, strategies to attract new retail, restaurant, office and housing, key urban design principles, implementation strategies, timing and funding.